Like a butterfly rising, in our wings we carry our strength and through our spirits we heal. Join African Student Programs in building community and solidarity with Chicano Student Programs' Semana de la Mujer. 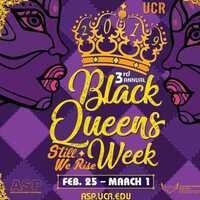 Part of Black Queens Week.